Siri will finally be making its debut on Mac Desktops and functionality is sure to reach the 3rd parties too. 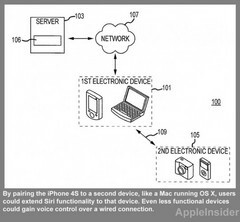 With the revealing of the iPhone 5 this summer, Apple has reserved a patent sill allow the connecting of an iPhone with a desktop computer for the sharing of the personal assistant, Siri. Since Siri was earlier released and becoming popular for the iPhone 4S, there have been a lot of forum discussions on whether the functionality will be available for the MacBook and Mac desktop users too. With the upcoming idea of the Siri-desktop union, users will be able to control their Mac via their iPhone directly. 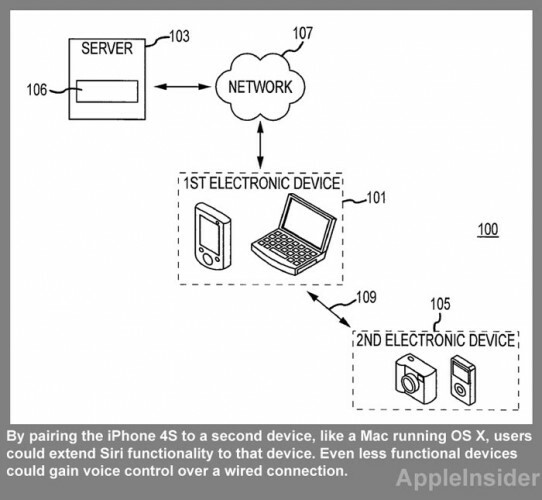 The “voice control system” patent discovered by Apple Insider has not only the iPhone 4S connecting wirelessly to your notebook/laptop, but even connection possession to 3rd party devices. The iPhone users may well use the personal assistant to tell the digital camera attached to a tripod when to snap, all remotely! The functionality and usage do sound very much like some next-level entertainment. Apple will surely connect this to the Apple iPhone 4, but judging by the patent image discovered, the company might release it to the iPhone 4S before the next level iPhone release this year. This kind of generational jump in functionality is generally reserved for new device releases, so maybe it will release with the next generation of Mac computers. Perhaps the MacBook Air - thin MacBook Pros by the mid-2012 will be quite expected.